Monikie Parish Kirk and Kirkyard situated at Kirkton of Monikie. Viewed from the South-West. 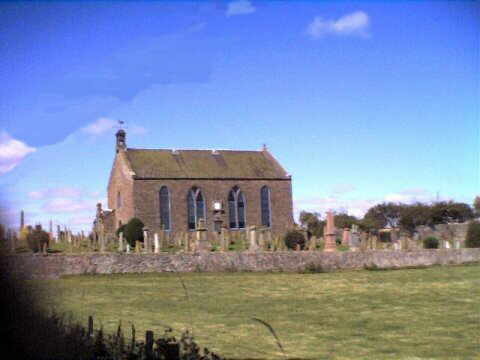 Newbigging Church, situated in the centre of Newbigging village, viewed from the main road. As from November 2007 the building has been sold. 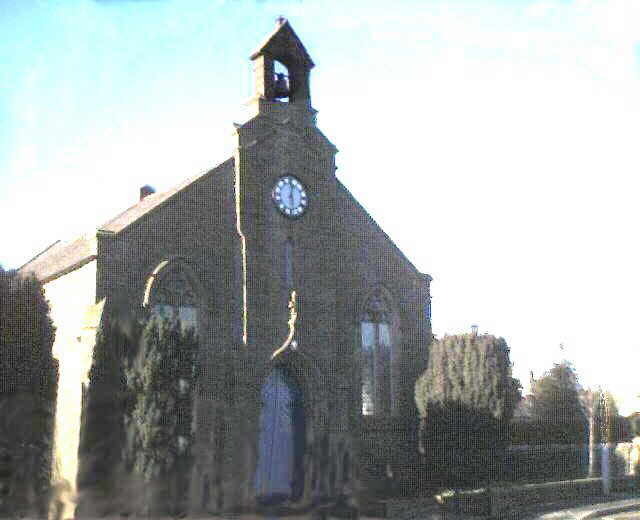 Newbigging Church has been sold and the final service is on Sunday 25th November at 10.30 a.m.
Newbigging church building is for sale. The following article is from the DUNDEE COURIER AND ADVERTISER mid January 2003(as edited). The congregational board of the linked charge at Monikie and Newbigging has agreed the closure plan. However. the church will have to win approval from Dundee Presbytery before it can cease using the Newbigging church. The closure has been on the cards for four years, since a ballot of the congregation opted to retain the kirk in Kirkton Monikie, explained parish minister the Rev. Gordon Mackenzie. With around two miles between the churches, the decision is unlikely to win universal favour and, in the intervening years since the original vote, there has been much discussion and debate about the proposal. However, the board has now decided the time is right to push ahead with the closure. If the plan receives the green light from presbytery, the building will then be put on the market, added Mr. Mackenzie. Monikie Kirk is the larger of the two buildings and has an associated kirkyard. 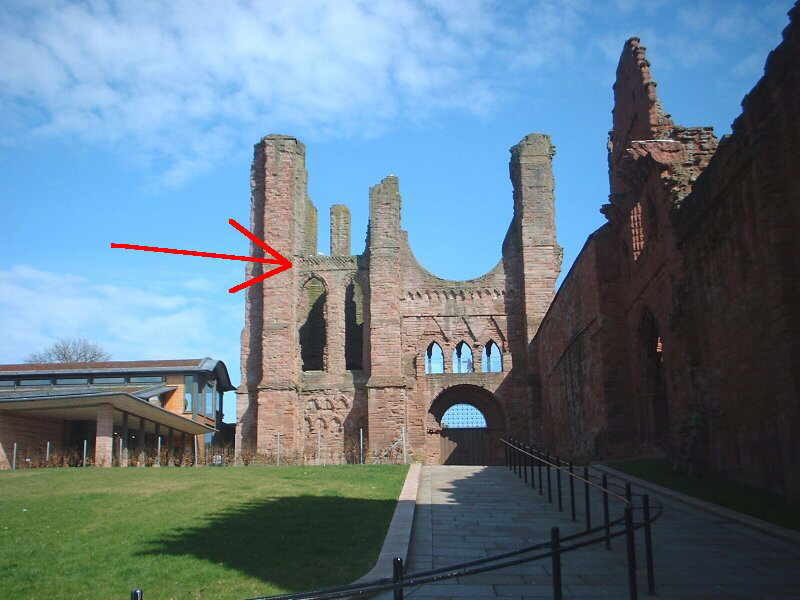 It was built in 1812 on the site of an earlier building, the parish having been gifted to Arbroath Abbey by Richard the Lionheart in the 12th century. 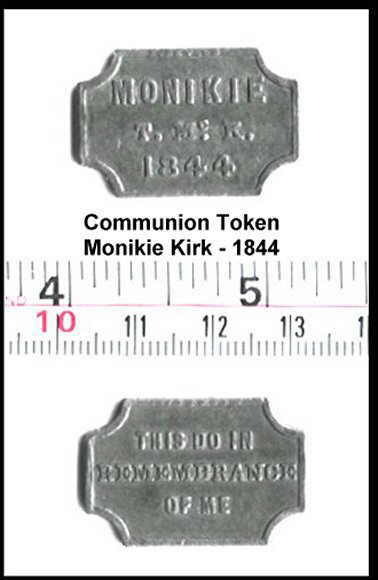 Monikie linked with Craigton Free Church in 1938, and in 1967 with Newbigging, which had itself previously linked with Monifieth North (Hillock) Church in 1921. 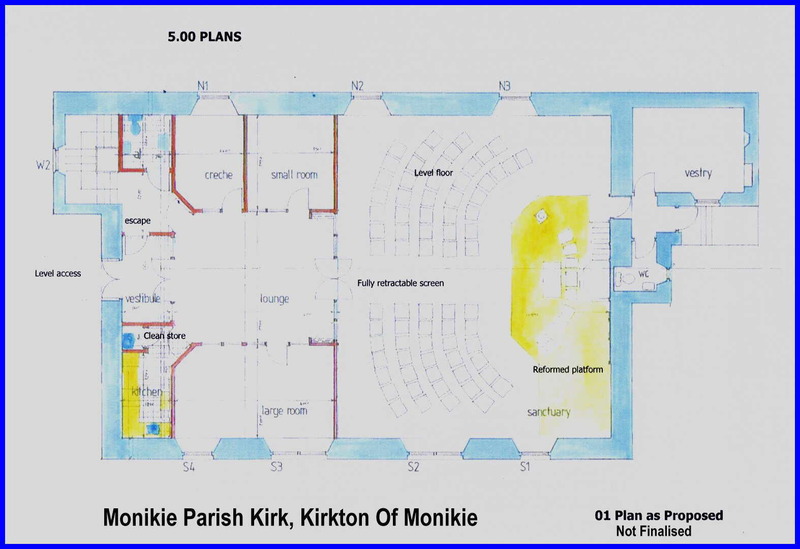 November 2007 - A large copy of the provisional plans for alterations to Monikie Kirk is available HERE. 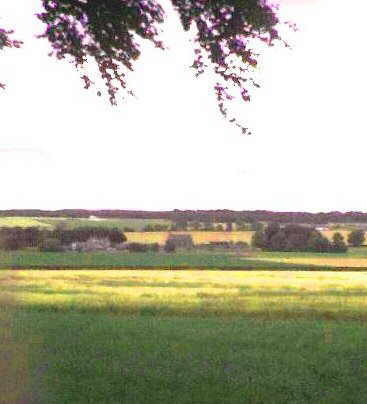 Monikie Kirk, with its surrounding kirkyard (graveyard) can just be seen in the very centre of the photograph, as viewed from the south, over the ripening fields of grain. Kirkton of Monikie Farm is to the left of the kirk. A closer view of Monikie Kirk and kirkyard. 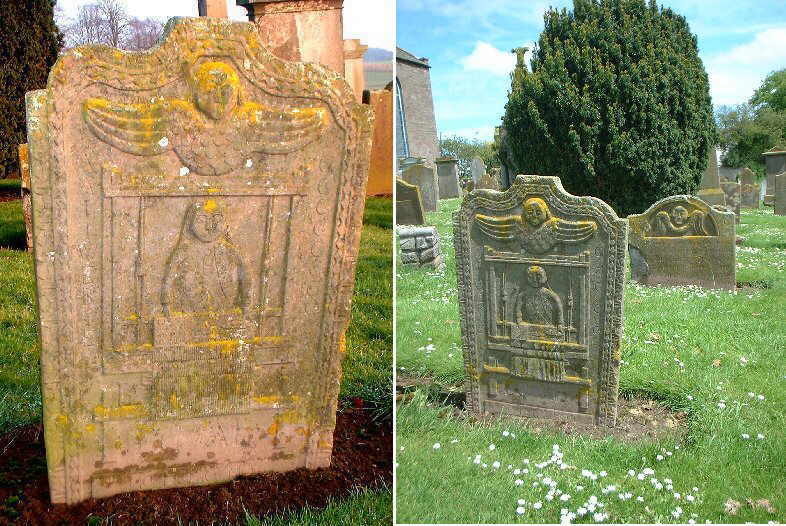 One of several gravestones in the kirkyard considered by some to be among the most noteworthy in any kirkyard. There are several others which clearly demonstrate the masons craft, and the symbolism used on memorials over the years. The earliest stone is believed to be from the 1600's. Many of the stones have suffered over the years from the weather and other causes. A few have fallen from their plinths, or been severally damaged, in some cases only a part of the stone/s appears above ground level. A list of the some of most of the inscriptions appearing on the stones in the original kirkyard is available CLICK HERE or see below. There are also lists of entries from the Old Parish Records and elsewhere, CLICK HERE. Archive copies of "Two-in-One", the Church Magazine, are available on this website. The list of copies of the new-style Newsletter is available and can be accessed HERE. The records of births/baptisms for Monikie Kirk since 1855 and Newbigging Church since 1918, to date, have been transferred to computer. If you have an interest please explain CLEARLY what that might be to the Session Clerk or Webmaster and we may be able to assist. 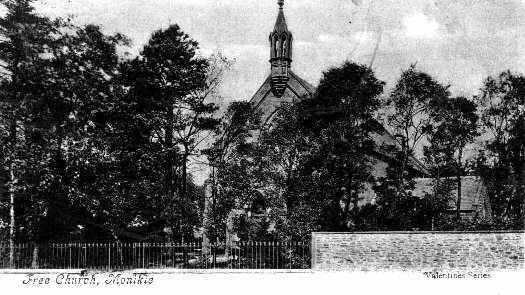 In order to read about the Monikie Parish, its churches and Social History through the ages, you are strongly recommended to purchase a copy of "THE MONIKIE STORY", written by a former Minister of the Parish, the late Rev. W. D. Chisholm, M.A. 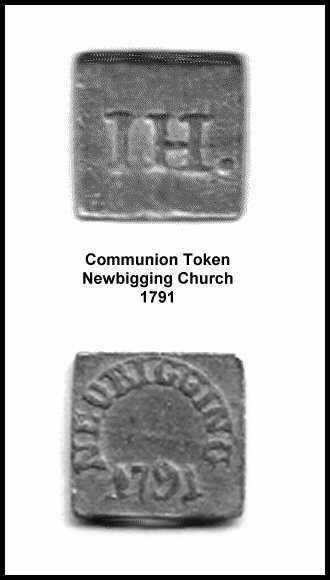 Articles about Newbigging and Hillock Churches, over the years, together with supporting documents and other pieces. A booklet may still be available in 'professionally-bound' format to raise funds. It also includes an article from an Australian contributor (L.A.W.) about his Newbigging ancestor. Please contact one of the Church Office Bearers for for information. The burial ground, or kirkyard, which surrounds Monikie Kirk on three sides, is well worth a visit to examine some of the most interesting and historic memorials in Scotland. A list is available inside the Kirk by arrangement, but enquiries should first be made to the Parks and Recreation Department of Angus Council at County Buildings, Forfar, Angus. * MEMORIAL INSCRIPTIONS & PHOTOGRAPHS!! The former minister (until October 2003), the Rev. Gordon Mackenzie, standing at the main door of Monikie Parish Kirk, at Kirkton of Monikie. The interior of Monikie Kirk, Angus, Scotland. 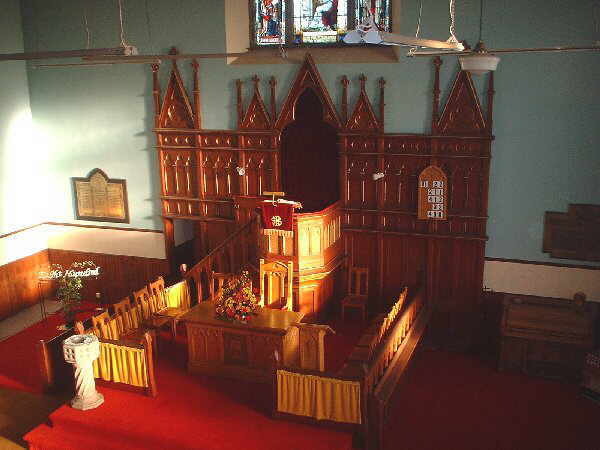 The interior of the former Newbigging Church, Angus, Scotland. The building has been sold and is no longer in use for worship. Read "The Moosie's Prayer " about Communion Day. 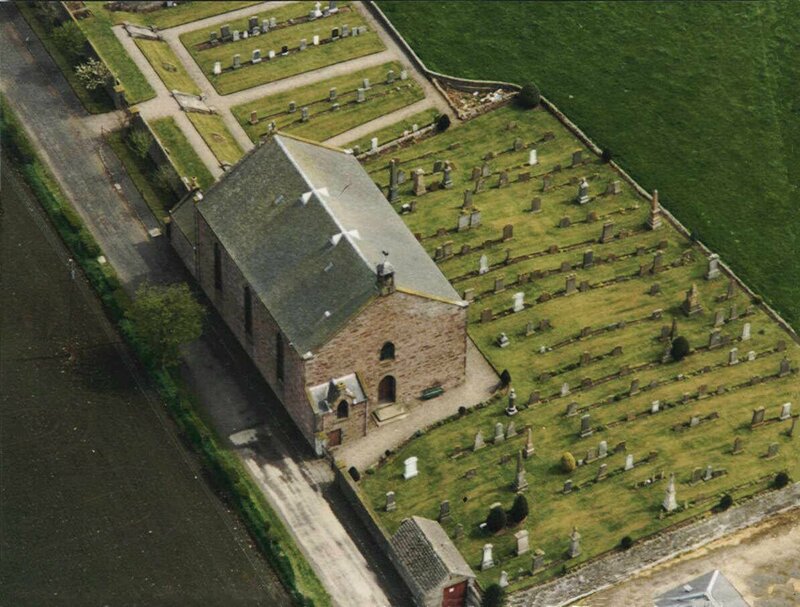 You may be interested to learn that a decision was taken quite some time ago that Newbigging Church is to close. More information regarding this matter should be made available by any Board Member. Summer 2007 - Various improvements are scheduled to take place at Monikie Kirk. November 2007 Newbigging Church has been sold. 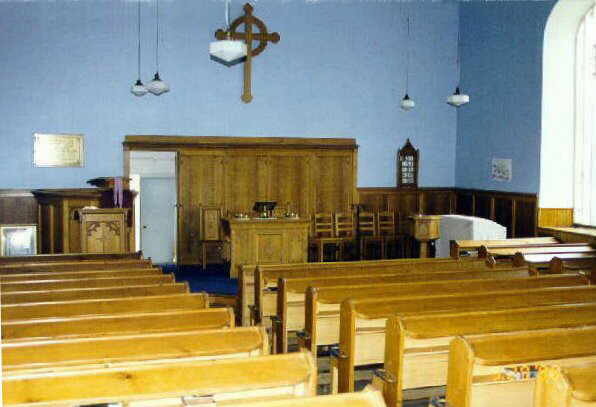 The Church of Scotland, Presbytery of Dundee, has a Prayer Page and you are invited to visit it.
. as it might be related in the Old Scots tongue, complete with appropriate music. Click this logo to read about the Church of Scotland. You may contact the webmaster, send a magazine contribution or a message for a church office-bearer, by email (see CONTACT).